But part of the draw is just being with like-minded folks… and soaking up the atmosphere in Oxford. We usually eat lunch somewhere on the square, but Patti suggested we go for a late breakfast at Big Bad Breakfast, (which is reviewed here and here ) just a few blocks north of the square in the Midtown shopping center. It’s named after Oxford author Larry Brown’s book of short stores, Big Bad Love. Lots of the menu items are named after local writers’ works, like the “Smonk Burger,” named for Tom Franklin’s novel, Smonk. I loved the brandy-spiked French toast. And the fresh-squeezed orange and grapefruit juices. W hile we were waiting outside for a table, Tom (Franklin) walked up with a poster about his book, which he had promised to bring in for the owner to display, so he stopped to visit for a while. And then came an embarrassing moment: I saw this guy walking by our table and said, “hey—would you take our picture?” As I began handing him my camera, Patti and Doug started laughing, then got up to shake hands and speak to him. And then he hugged Patti. 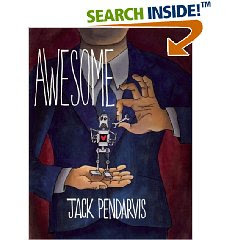 And they introduced me to Jack… Pendarvis! and he gracioussly took this photo for us… (right). Wow…. a photo credit to Jack Pendarvis in my blog! On the way back to Memphis I began thinking about revisions I want to make to the chapter the group critiqued, as well as the essay. But now I’m thinking about the Game. And this time, it’s not the Olympic basketball game I’m thinking about. A friend and published author told me a couple of months ago that I would soon get tired of the game… of trying to find an agent—and then I would get serious and focus on my writing. He had published two novels, but was struggling with getting his third published, and was tired of shopping for a new agent himself. He gave an amazing talk about why we write at a writers workshop in June, and of course I came away inspired. But…. Not deterred from my search for an agent. Because, as superficial as it might sound, I am not just writing for “therapy” or my “friends and family” or just the joy of seeing the words on my computer monitor. No. That is definitely not what I’m after. I just finished reading Elizabeth Dewberry’s novel, His Lovely Wife, and I love her descriptions of the emotional journey the main character, Ellen Baxter, makes, especially when she says, near the end, that she wasn’t writing her story for revenge, but “because I needed to explain something about my childhood to the child in me.” Maybe there’s some of that in my motivation for writing my memoir, but there’s so much more. I want this memoir (and 2-3 more books) to be published, and I’m actively seeking agent representation. Yes… the time-consuming, energy-sapping task of researching agents and carefully drafting personal email queries continues. I’m trying to learn to keep the business side of writing separate from the creative side, but my years in publishing (trade magazine), marketing and advertising seem to have left me a bit broken. I’m just not able to quit thinking about the publishing side of things, even while continuing to write and revise my memoir and a few essays. The September/October issue of Poets & Writers offered another great article/interview with a successful agent: Molly Friedrich. Can she mean this? With successful clients like Sue Grafton (S Is for Silence) and Frank McCourt (Teacher Man)… both New York Times best sellers.? As intimidating as her description of a good memoir is, I’m still going to query her. 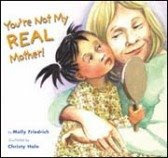 Oh, and this is interesting: Friedrich wrote a children’s book, You’re Not My Real Mother! after her adopted daughter told her that one day. My adopted daughter and sons don’t play major parts in my memoir-in-progress (it’s my story, not theirs) but what an interesting human connection. It’s good to be reminded that agents are people, too. And now, to settle down and watch the closing ceremonies of the Olympics and regroup as we enter the final week of summer….